I'm 24 and also fairly active. I play on a flag football team (for fun) at the university I go to. Well, as we were warming up before the game, I had a conversation with a friend of mine. He tore his acl, mcl, medial and lateral meniscus 2 years ago playing basketball and is still recovering. I told him that tearing my acl would be horrible because once you tear something in your knee, it's likely that it will never be the same. (foreshadowing) As we were playing the game 20 minutes later, I caught a pass and was running up the sideline. I decided to run out of bounds at the first down marker. When i went to change directions, i felt my left knee partly dislocate inward. On my next step trying to slow down, i felt my knee go back straight and then partly dislocate outwardly. The next thing i knew i was on the ground in excruciating pain. I laid there for a minute while holding my knee. My teammates told me to try and walk it off. I tried to get up but was unable to without help. My friends assisted me to the bleachers where an emt came over to examine me. The extreme pain subsided into a dull ache after five minutes. There was also minimal swelling. He and I both suspected it was just a sprain. I carefully walked to my car to drive home and noticed how unsteady my leg felt. It kept wanted to give in on me. Iced my knee when i got home and went to sleep. thankfully agreed to it. Upon completing the scan, I said "I suspect everything is normal." My instructor laughed and said, "You should probably come look at this. We cant find your ACL." I thought they were joking until I saw the images. I knew this meant I had torn my ACL and could also see severe bone bruising. My instructor took my images to the radiologist so he could confirm that I indeed tore my ACL. I saw an orthopedic surgeon four days later to find out my options. I told him that although my MRI obviously shows a torn ACL, I had my doubts it was really torn. I thought there would be more swelling and pain than what i had experienced. He did some physical test which included twisting my lower leg. He then informed me that tearing the ACL is actually painless, its the bruising of other areas that causes the pain. He immediately recommended surgery 4 weeks later. He gave me the options of a patellar graft or a hamstring graft. He described each to me and assured me he was very experienced in both. He recommended I do research on my own to decide which one i wanted. I talked to several people who had the patellar graft and they said they hate it. They have continued to have anterior knee pain even 10 years later. Apparently kneeling down causes pain from the nerves and scar tissue in front of the patella. I have now decided to have the hamstring graft and am scheduled for surgery on Dec 2. 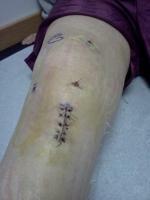 I have had many surgeries repairing broken bones. However I am very nervous about this surgery for some reason. I feel like my knee will never be the same and I will always be afraid of tearing it again. It has been very interesting and enlightening to read others' stories on their injury and recovery. Rehab, it seems, is the most crucial thing to a full recovery.